We took a vote and are excited to announce our project for Second Wednesday 2019! From Border Creek Station comes a wonderful mystery quilt opportunity! Like years past, we can promise you’ll love the beautiful quilt you will finish through this program. New this year comes the chance to choose between two fabric collections; Portsmouth by Minnick & Simpson or La Vie en Rouge by French General. Reserve your kit and color choice by registering now with a deposit. 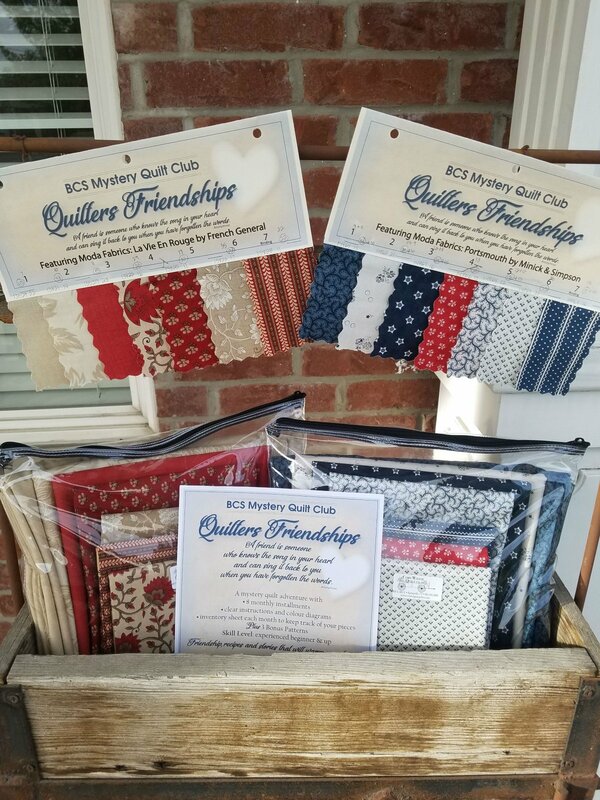 Purchase your complete fabric kit in full before the first club meeting then join us every second Wednesday beginning January 2019! Class meetings will include block demos, delicious recipes, show-and-tell and lots of fun with quilting friends! Our longest running club here at the Corn Wagon, The 2nd Wednesday Club has roots in our earliest days of business 19 years ago. Some of these quilters have been with us since the beginning, others are new members, all are friends with a common love for quilt-making. By participating in a block-of-the-month program, this 12-month club focuses on making a new quilt each year. Club Fee: Returning members $20.00/year and new members $35.00/year. OR $120 deposit to reserve color selection with remaining balance due 01/09/19.